The Nikon FM3A is an advanced semi-professional-level, interchangeable-lens, focal-plane shutter, 35mm film, single-lens reflex camera. It was manufactured by Nikon exclusively in Japan, on small-volume assembly lines by especially trained assembly technicians, from 2001 to 2006. The camera was available in two finishes: black, and satin chrome. The introductory suggested US list price for the chrome body only (no lens) was $820. Though solidly in the Nikon FM tradition of fully manual compact SLRs, the FM3A was also intended to answer the demand for a replacement for the famous FE2, discontinued in 1989. The FM3A was the first camera in the FM series to have an additional electronic mode for both aperture-priority automatic exposure (AE) and through-the-lens (TTL) flash. The camera proved popular with photographers as a rugged travel camera and as a backup for more fragile, highly automated film and digital cameras. The FM3A was built to a level of workmanship and material quality beyond that of most competitive cameras available during its short production run. It had the advantages of the FM and FM2n, generally regarded as two of the most reliable cameras ever built (both in terms of operation under extreme conditions and in day-to-day reliability reports from repair shops and magazine surveys). The FM3A has an extremely strong body of copper silumin alloy. The electronics are not only well protected within the body but are of extremely high quality, including the flexible circuits. The camera's film transport consists of strong, hardened metal gears and moving parts, mounted on clusters of low-friction ball bearings. The modern vertical metal shutter uses precision-tapered strong aluminium alloy blades and oilless self-lubricating bearings. A roller bearing assists film transport. The guide rails are wide, precisely machined and made of stainless steel. The mirror frame is titanium and very solid. The mirror uses the same mechanism found on the Nikon F2, with some modern improvements designed to further reduce effects of vibration and mirror bounce. The FM3A, like older Nikon SLR cameras, has a close-tolerance, low-friction design requiring minimal lubrication, and so can reliably operate in temperature extremes of -40C to +50C. This zealous workmanship has a practical side: Nikons have accompanied more photographers to extreme environments — the summit of Mount Everest and the depths of the Saharan Desert — than any other SLR camera. The FM3A has a hybrid shutter that operates either mechanically or electronically. In manual mode it is mechanically timed, from 1 to 1/4000 second, T, and B. In automatic-exposure mode when electronically timed, it steplessly selects shutter speeds from 1 – 1/4000 second. Either way the camera employs Nikon's standard 60/40 center-weighted TTL metering, and has TTL flash metering with a sync speed of up to 1/250 second. There is an AE lock button on the back of the camera and a Flash Compensation button on the left of the lens mount. The FM3a has a self-timer which automatically raises and locks the mirror before the exposure is made, a hot-shoe, and a PC connection. The camera uses a standard cable release, and is the first manual-focus Nikon SLR to have automatic DX (as well as manual) film speed indexing. The film speed can be read off the film canister through a transparent window on the back of the camera. The meter of the camera is switched on when the film advance lever is moved away from the body and the shutter lightly depressed. It cuts itself off in about 15 seconds. In manual mode exposure is set by matching the thin smoothly swinging needle in the left of the viewfinder with the wide translucent blue bar that indicates the selected shutter speed. In this ingenious finder, it is easy to see the number of stops by which the camera is over or under the correct exposure. The only metering pattern available is the old standard Nikon 60/40 pattern. As with many Nikon SLR cameras, the selected F-stop can be read right off the lens in use through the Aperture Direct Readout (ADR) at the top of the viewfinder. Like the FM2n and its predecessors the FM3A allows manual operation with a fully mechanical shutter. If the batteries die in an FM3A, the photographer still has full use of every shutter speed marked on the dial. Like the FE and FE2 the FM3A is also capable of aperture-preferred auto exposure control. The photographer selects "A" on the shutter speed dial, switches on the meter in the normal way, and selects the F-stop on the lens, and the camera body selects the shutter speed steplessly. Shutter speeds are indicated by the thin needle that swings up and down the scale on the left of the viewfinder. Again, the aperture is visible thorough the ADR. This mode also uses the 60/40 center-weighted metering. The highest shutter speed in the AE range is 1/4000, but slow speeds extend well below the 1 second marked in the viewfinder, as long as the camera is in AE mode. (In manual mode, speeds slower than 1 second require use of 'B'. This is a departure from the FE2, which like the F3 allowed manual selection of shutter speeds up to 8 seconds.) 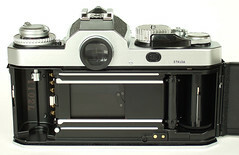 The FM3A's electronic operation is silent during long exposures, except for the noise of the shutter opening and closing. The AE automation of the FM3A provides simple convenience in taking photographs in fluid situations, while still allowing some control by the photographer. Though Nikon has long since adopted other automatic exposure modes — including shutter priority, program, and variable program — many photographers still find the simpler semi-automatic AE feature of the FM3A appealing. Another FM3A innovation over earlier FM/FE models was in flash operation. The camera adds TTL flash, not found on its predecessor the FM2n, as well as more control to the TTL flash capabilities of the old FE2. Any Nikon TTL flash from a old SB-15 to the latest SB-800 can be used on the camera. In 'A' mode the FM3A automatically switches to 1/250 second shutter speed and measures the flash through the lens. In manual mode the FM3A is ready to measure the flash in TTL mode, but it also continues to meter normally, allowing the photographer to select any speed from 1 second to the top flash-sync speed of 1/250 second. Held down as the subject is metered and photographed, a Flash Compensation button to the left of the lens mount will automatically apply a compensation of -1 EV to any mounted Nikon-compatible TTL flash as it fires. Both Nikon and third-party flash units can be mounted in the FM3A's hot shoe and used in manual or non-TTL auto modes. When mounted, a compatible flash will activate a ready light in the viewfinder. An LED light also glows steadily when the flash is ready, and blinks once after the flash is fired and correct exposure is achieved. The FM3A signals underexposure by blinks of the LED in rapid succession. The FM3A does not have all flash capabilities of modern AF cameras, such as the ability to program flash compensation into the flash itself. Like the FM2n and FE2, the FM3A is designed to mate with the old MD-12 motor drive. It also takes the full range of other accessories available for compact Nikons including diopter correction lenses, a data back, bellows, extensions rings, flash units, and interchangeable focusing screens. The FM3A can use the full range of Nikkor AI, AIS, P, AF, and AF-D lenses. In AE mode the FM3A can mount and use a G lens, and gives a bright full aperture image but actually operates at the smallest aperture of the lens. You can only correctly expose pictures with 'stop down' metering and AE lock to hold the metering when the exposure is taken. Unlike the original FM and FE cameras, the FM3A cannot mount non-AI lenses unless they have been converted to AI specifications. Mounting a non-AI lens can cripple or damage the camera by binding the metering tab, and this is made more problematic with Nikon's Perspective Control lenses — the 35/3.5 PC cannot be used at all. Earlier versons of the 35mm F2.8 and 28mm F4 may or may not fit and operate properly, though later versions of both lenses work acceptably. The FM3A was frequently sold as a 'kit' camera with a 45mm F2.8P lens, reportedly a Tessar formula. An article in the March 2002 issue of Popular Photography Magazine called the 45mm F2.8 one of the best 35mm normal lenses ever tested. It is a superb lens, compact and sharp, and it looks great on the camera, especially with its unique convex hood. Because of its versatility and ability to function in both electronic and mechanical modes, the FM3A is desirable and holds value in the used marketplace. 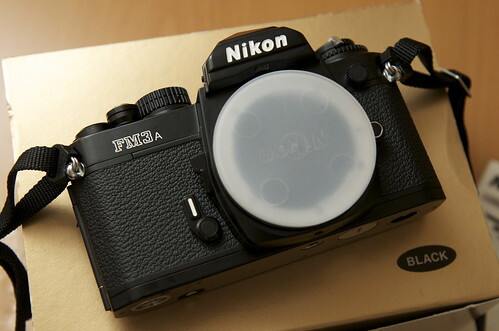 The FM3A was itself a response from Nikon to the FE2 and FM2's increase in values after their discontinuance coinciding with the introduction of auto-focus cameras. 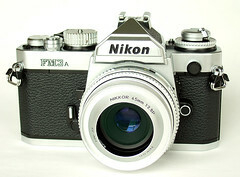 After the emergence of digital cameras, Nikon then discontinued the FM3A, leading to a similar effect. According to one vendor's estimate tool, a used FM3A in good working condition can cost in excess of $650.00. The FM3A appeals primarily to photographers interested in full control over their photography, as well as reliability and durability in a camera to be used hard out of doors. The camera's classic metal construction also attracted customers wanting a camera built to earlier generation standards. It was no coincidence that photographers devoted to cameras such as the Leica M also found the FM3A attractive. Nikon was rumored to be considering a digital successor to this "modern classic", though this has not yet (early 2007) happened. Though FM3A sales remained steady, they were miniscule compared to Nikon's other cameras, and increasing costs led Nikon to announce it was discontinuing production and sale of the FM3A on January 11, 2006. ↑ The name officially used by Nikon has the capital letter "A" in a smaller font than "FM3". The name is commonly written "FM3A" or "FM3a". This page was last edited on 12 January 2018, at 06:20.